We have some more final numbers for each of the key Mexican races from Sunday’s election, and in each case, it suggests that Mexico was warier than polls suggested about returning the Partido Revolucionario Institucional (PRI) — the party that governed Mexico for 71 years until 2000 — to power. Furthermore, the results suggest Mexicans, under the right circumstances, may be turning to the left and, above all, the leftist Partido de la Revolución Democrática (PRD) may, like so often in its recent history, have lost a key opportunity to win real power in Mexico. When you look to the congressional races and the key gubernatorial races too, there’s reason to believe that at each turn, the PRI hasn’t won quite the sweeping victory that it once expected, and in many ways, the PRD and even the center-right, ruling Partido Acción Nacional (PAN) over performed from expectations. Presidential Election. 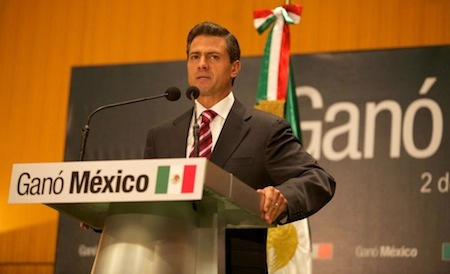 Enrique Peña Nieto, the PRI’s candidate has won with just 38.15% to 31.64% for the PRD’s Andrés Manuel López Obrador, the candidate of the Partido de la Revolución Democrática (PRD). The candidate of the PAN, Josefina Vázquez Mota, trails with 25.40%. Gabriel Quadri de la Torre of the Partido Nueva Alianza (PANAL), won 2.30%. Vázquez Mota managed to win a handful of states in the north-central Mexico (unlike the PRI’s 2006 presidential candidate, whose third-place finish was much more devastating), the manufacturing and industry headland that has always been the PAN’s stronghold. Likewise, López Obrador carried many of Mexico’s southern states and the Distrito Federal. What is so striking is that Peña Nieto’s lead was not the double-digit lead most polls suggested, but just 6.5%. It suggests to me that the PRD made a colossal mistake in nominating López Obrador, with all of his baggage — voters remained wary of someone they suspected remained an old-line statist leftist and he never quite shook the unpopularity that he developed from the months of protests following his very narrow loss in the 2006 election. It seems unmistakable that the outgoing head of government of the Distrito Federal, Marcero Ebrard, would have presented a much more moderate campaign and may well have given Peña Nieto a real campaign, if not overtaken the PRI’s candidate altogether. It was a clear missed opportunity for the PRD in renominating López Obrador. Even today, López Obrador has refused to concede defeat amid what he calls more corruption and fraud than in 2006, is asking for a full recount, and is likely already turning off moderate voters in what Mexico’s political elite fear will be a rerun of the months of protests that followed the 2006 election. Although he may have some valid points, notwithstanding his closer-than-expected result, it seems unlikely that a recount could make up 6.5% of the total vote. 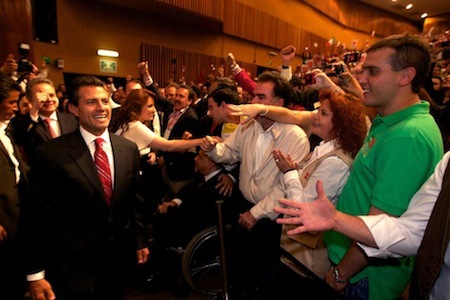 Above all, the rise of Peña Nieto indicated more disapproval for the PAN, and the Calderón administration in particular, than any love or nostalgia for the PRI. A modern, competent PRD effort could have well caught fire. Congress. Unlike election night predictions and polling predictions prior to the election, the PRI and the Partido Verde Ecologista de México (PVEM), Mexico’s Green Party, a longtime PRI ally, did not win an absolute majority in either the Senado, the upper house of Mexico’s Congress, or the Cámara de Diputados, its lower house. The PRI and the PVEM actually lost ground — going from 262 seats before to just 242 seats now. The PAN lost 24 seats and looks likely to hold just 118 in the new Congress — surely a solid defeat, but hardly a wipeout. Given that the PRI will not command an absolute majority in the lower house, the PAN will likely be the party that determines which PRI-initiated reforms will be passed in the next three years. This will assuredly provide comfort to Mexicans, such as those in the #YoSoy132 movement, that were so concerned with the PRI’s return to power. Not only will the PRI be checked by much stronger institutions than existed two decades ago, it will need to work with the PAN to pass reforms — in many cases, market-friendly reforms that the PAN itself has been proposing for years. PANAL won 10 seats, an improvement of two. In the meanwhile, the big winner was the PRD and its leftist allies, who will improve on their 88 seats to 140 in the new Congress, and will have a a base to grow upon for the 2015 midterm elections and the 2018 general election. In the Senato, the PRI will have 57 votes to 41 for the PRI, 29 for the PRD and one for PANAL — again, it will require the PAN’s approval to pass any PRI legislation in the upper house. The rapid count from Mexico’s federal election institute is in, and has projected that, as expected, Enrique Peña Nieto, the candidate of the the Partido Revolucionario Institucional (PRI), has been elected the next president of Mexico. Peña Nieto had between 37.93% and 38.55% of the vote. Andrés Manuel López Obrador, the candidate of the Partido de la Revolución Democrática (PRD), who narrowly lost the 2006 presidential election, won between 30.90% and 31.86% of the vote. The candidate of the ruling Partido Acción Nacional (PAN), Josefina Vázquez Mota, won between just 25.10% and 26.03% of the vote. 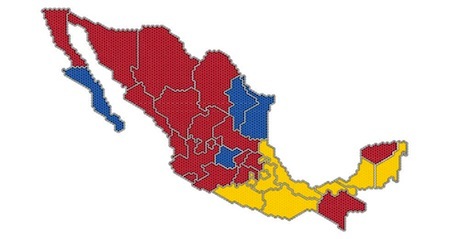 As shown below in an electoral map from El Universal, the PAN still eked out a plurality in the vote in some of its strongholds in Mexico’s north, and the PRD held on to many of the states in central and southern Mexico that have long been its strongest region, while the PRI found success across the country. López Obrador has not yet conceded defeat, however, maintaining that he will wait for the final count. Outgoing president Felipe Calderón has promised a cooperative transition, pending final results from Mexico’s elections institute. The ability to control both the executive and legislative branches was seen as a major opportunity for the PRI to implement tax reforms, labor reforms and energy reforms that the PAN has not accomplished in the past 12 years of occupying Los Pinos. Across the country, up to a quarter of Mexicans also voted in gubernatorial elections in six states and selected a new head of government in the Distrito Federal. In the DF, the PRD’s candidate, Miguel Ángel Mancera, the current DF attorney general, won the election easily with 63.5% of the vote, extending the PRD’s longtime advantage in the DF — the party’s candidate has won the race since 1997, when Mexico City’s residents first had the opportunity to vote directly for their head of government. In Morelos, exit polls showed the PRD’s candidate, Graco Ramírez Garrido Abreu, leading with 41% of the vote, with the PRI’s candidate, Amado Orihuela Trejo, following in second place with 37%. In Tabasco, the PRI’s candidate, Jesús Alí de la Torre, mayor of Villahermosa, and the PRD’s candidate, federal senator Arturo Núñez Jiménez, were locked in a very tight race — exit polls show the PRI candidate leading 37.03% to 35.81%. 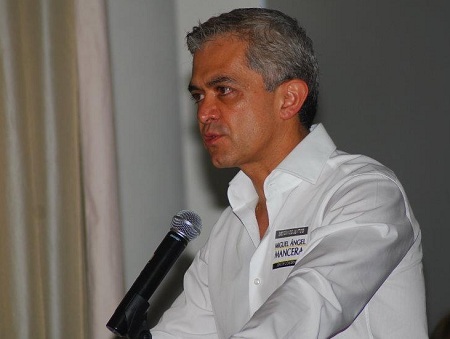 Although the PRI has declared victory in Yucatán, its candidate Rolando Zapata was leading with just 30.01% to the PAN’s candidate, Joaquín Díaz Mena with 28.32%. The PAN held the governorship of Yucatán previously from 2001 to 2005. Exit polls, however, showed Zapata with a more comfortable margin of victory of about 49% to 40%. In Jalisco, Jorge Aristóteles Sandoval Díaz was set to win 44% of the vote to just 33% for the PRI’s candidate — Jalisco is Mexico’s third-largest state and has been controlled by the PAN since 1995. In Guanajuato, however, Mexico’s fifth-largest state, and another PAN stronghold since 1995 (former president Vicente Fox got his political start here), the PAN’s Miguel Márquez Márquez, a state minister for social and human development, seems likely to have won: he leads with 49.77% to just 38.04% for the PRI candidate. In Chiapas, the 32-year-old Manuel Velasco Coello, the PRI-allied candidate of the Partido Verde Ecologista de México (PVEM), was leading with 64.3%. With polls showing that Sunday’s federal elections will be a landslide for the Partido Revolucionario Institucional (PRI) and its presidential candidate, Enrique Peña Nieto, we have to look to the state-level elections for any suspense. 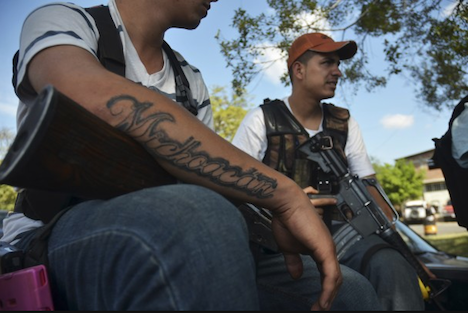 Not to be forgotten amid the federal elections, six states and Mexico’s federal district hold elections on Sunday. In the Distrito Federal, Miguel Ángel Mancera (pictured above, bottom), the candidate of the leftist Partido de la Revolución Democrática (PRD) is likely to win the race for head of government, a position the PRD has held continuously since 1997. 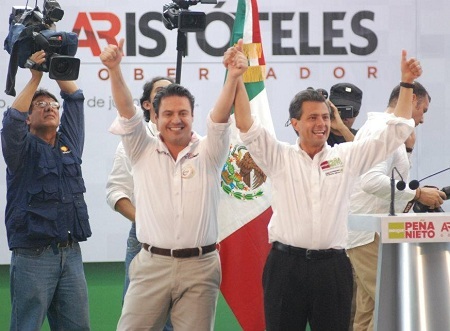 In Jalisco, Guadalajara’s mayor Aristóteles Sandoval, another young and charismatic priista (pictured with Peña Nieto above, top) is likely to take the governorship from the Partido Acción Nacional (PAN) for the first time since 1995. The tightest race looks to be in tiny Morelos, where the PRI and the PRD are locked in a tight battle to succeed the outgoing PAN governor. The PAN is expected to hold onto the governorship in Guanajuato, which it has also held since 1995 when former president Vicente Fox first won it. The young, PRI-affiliated Manuel Velasco Coello is likely to win in Chiapas, and the PRI also looks set to retain the governorships of Yucatán and Tabasco.